This page, the Hanging of Dutch Charley and Big Nose George, the election of John E. Osborne. 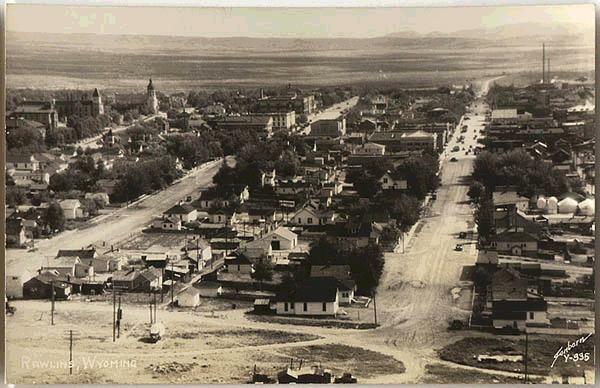 The street closest to the viewer on the right, is Cedar, to its left is Buffalo, and at the far left is Pine. In the early days of Wyoming, all business transactions were done in cash. Thus, as an example all payrolls for the Railroad were carried in cash. Bullion from the San Francisco mint would be carried in a safe in the mail car. This, unfortunately, as in the instance of the stages on the Deadwood Stage road, made tempting targets. One of the more bizarre episodes in Wyoming history related to the attempted robbery on August 14, 1878, of the No. 3 Westbound train six miles east of Medicine Bow by "Dutch Charley" and "Big Nose George Parrott." The robbery was foiled by an alert section maintaince forman. His crew had been working near the bridge over the Medicine Bow. It was the end of the day. In the area, the railroad was constructed on a high embankment. The foreman had left some of his tools near the bridge. As he walked back to retrieve them, he noticed that on the embankment some of the spikes and plates holding the rail on one side of the track had been loosened and that a piece of telegraph wire ran from the rail to behind a nearby embankment. He realized that road agents were probably planning to derail the westbound train and were probably lurking nearby. Without making any reaction he calmly walked back, retrieved the tools and walked back with the tools until he had rounded a curve and was no longer visible. The plan by Big Nose Parrots' gang was apparently to dislodge the rail and derail the train it as it crossed the embankment. The wrecking of the train would would have made looting of the baggage car and robbing those passengers who survived the wreck much simpler. The foreman after rounding the curve was able to flag down the train which was then put into reverse averting the robbery. Chief Dispatcher, Laramie Division, Edward Dickinson and Albany County Sheriff Daniel Nottage inspected the scene and determined the nature of the planned robbery and observed a large number of hoof prints where the horses had been kept. At the request of Dispatcher Dickinson, so as to not alert the road agents a false story was put out that that nothing serious had taken place; the train would not have been derailed, and that it was probably someone who bore a grudge against the company. In the meanwhile, extra security was put in place. The extra security did not necessarily go unnoticed. Henry Seton-Karr, the major domo of the Pick Ranch near Saratoga, about that time was returning to Fort Steele to tend to business on his ranch. He noticed a guard, "armed to the teeth." He enquired of the conductor who informed him that road-agents had been active. They were, Seton-Karr was told, "either the James boys or Big-nosed George and his gang." Indeed, at the time, the Rocky Mountain Detective Association in fact believed that the gang consisted of "Dutch Charley"Buress," Frank K. Towle, Sim Wan, Big Nose George, Tom Reed, Sandy Campbell, Cully McDonald and an individual going under the name of McKinney. 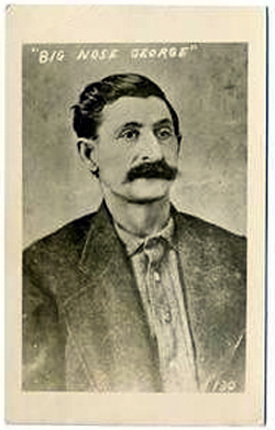 Several years later, Big-Nose related that McKinney claimed to Frank James. It probably was not true, McKinney was most likely "Reddy" McKimie. To the southwest of the present town of Elk Mountain lies a mountain of the same name. Rattlesnake Creek flows from the northwest side of the mountain. Search parties tried to track the hoof prints to Elk Mountain. From the west, Carbon County deputy Robert Widdowfield and Special Railroad Detective Henry H. "Tip" Vincent trailed the gang into Rattlesnake Canyon. There at the foot of a gulch on the Northside of the nountain they found a recent campfire. As Widdowfield was feeling the ashes to see how recent the campfire was, a shot from Big Nose hiding in the bushes killed Widdowfield who fell into the ashes. Vinson apparently attempted to run and was shot. When Widdowfield and Vinson did not return, Vinson's brother set out to find the two. He came across a government survey party who described the two going by and having heard shots. Vinson's brother surmised what had happened and went back for a posse. It being summer and warm, the posse only had to follow their noses. Encampment lawyer Charles Winter later wrote of an apparent witness, "The bodies was pretty far gone. Ever smell a decayed human? Doctor, eh? Well, you know what it is then. It stayed with me for three months." The gang made good their escape. In September Dutch Charley had organized a new gang consisting of an outlaw named Erwin, Manuse, Durtch Chaley, Frank Ruby, A. C. Douglas, Hank Harrington, Frank Howard, and Charles "the Kid" Condon. The Kid had received his name as a result of becoming an outlaw at the age of 16. He was originally from Maine. In December, the gang had decided to return to the scene of the crime so to speak and rob the train as it crossed Rock Creek north of Elk Mountain and also to rob former governor John Thayer's hotel at Rock Creek Station. It was necessary, however, to reconnoiter the town. Fortuitously, Frank Howard was elected to make the report. Governor Thayer's Hotel, Rock Creek Station, Wyoming Territory, 1877. On reaching Rock Creek, Howard had a change of heart and revealed all to former governor Thayer who lost no time in alerting the Union Pacific who in turn employed former Albany County, Sheriff N. K. Boswell. He raised a private posse with an offer of $250.00 each for the capture of the gang. Howard assisted Boswell. The posse located a farmer who with a little persuasion revealed the general area of the gang's campsite. A drift of smoke from the gang's campfire rising in the early morning hours confirmed the location. It was Christmas morning and all but one of the gang were sleeping in their bedrolls. The one who was tending the fire was unarmed. Thus the gang was caught unawares. 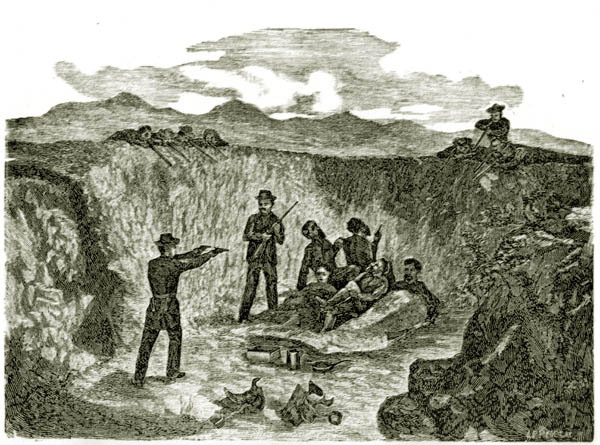 Capture of Dutch Charley's Gang near Rattlesnake Canyon, Elk Mountain, Wyoming Territory, December 25, 1878. After taking the prisoners to Laramie City where they were held in the jail. It was decided that since the murder of Widdowfield and Vinson had taken place in Carbon County, Dutch Charley would be taken to Rawlins to stand trial. On the way, it was necessary for the train to pause at Carbon for ten minutes to take on water and coal. As the train was taking on water and coal in Carbon, a welcoming crowd went through the train. They had to break down the door of the baggage car. Holding guns on the guards and messenger, they found Dutch Charley in handcuffs hiding under a pile of buffalo robes. Removed from the train, he was stood on a fifty gallon whiskey barrel in front of John Miliken's saloon. A rope was tossed over a cross piece on a telegraph pole. It was, as charles Winter later wrote, not necessary to go through the formality of reading "a typewritten death warrant." Dutch Charley was hoisted up off the barrel and then let down in an attempt to gain a confession. Then, Miliken later recalled, Ann Widdowfield, Robert's mother, called out, �You bad man! You shot my poor son!� With that up he went again and down again, perhaps a dozen times. Each time as he was let down, the barrel seesawed back and forth until Elizabth Widdowfield, the wife of Joseph Widdowfield, Robert's half-brother, Kicked the barrel out from under Dutch Charley. Dutch Charley's body remained suspended until the next day when the sheriff finally arrived. When the morning train passed by the conductor closed the curtains so as to avoid have the passengers offended by the grusome sight. When the sheriff arrived from Rawlins, the body was cut down and thrown in an empty coal car to complete the trip to the county seat. There his body was turned over to Daley's Lumber Yard for final arrangements. Writer's note: Daley in addition to selling lumber also sold caskets. Frank Towle returned to Powder Rivr Country. About a month later, he attempted to rob the Deadwood Stage and was shot and killed in the process. McKinney went to Montana and ultimately arrested a tried for a different crime in Ohio. About two years later Big Nose got drunk in a Miles City and boasted of the killings at Elk Mountain. He was arrested and returned to Rawlins by Carbon County Sheriff James Rankin for trial. At first, Big Nose plead guilty, but the plea was withdrawn on the basis that there was a flaw in the indictment. The trial seemed to go slowly slowly with much erudite argment between counsel. After two days, the residents of Rawlins beaome restless. Big Nose withdrew the not guilty plea. Not withtanding that Big Nose had sustained a "jail house conversion", he was sentenced to death for April. A group gathered in Pat Rooney's saloon. Henry Seton-Karr later recalled that Will Hugus, the manager of the J. W. Hugus & Co. store on Front Street, expressed the sense of the group, "This yer palaver in the court-house has been goin' on long enought boys. I didn't calculate to see George get too fat at our expense." The next day, Seton-Karr and his ranch foreman, Frank Earnest found it approopriate to attend to some business at the ranch. That night Big Nose attempted an escape by hitting the jailer Robert Rankin with his handcuffs. The escape was averted by Rankin and Mrs. Rankin. Others, such as D. W. France who would later serve on the Coroner's jury, found it appropriate not to be out the next night. At about 7:30 p.m. March 22, the alarm was spread that Big Nose had unsuccessfully attempted to escape. Additionally, according to the Carbon County Journal, March 26, 1881, it became known that Big Nose's lawyers "were preparing papers for the purpose of springing the insantity dodge on the day of execution." For some reason, not withstanding that on Front Street in addition to Rooney's, there were two other saloons, two hotels, two billiard halls, and one all night restuarant, the street became quiet. Between 10:00 p.m. and 11:00 p.m. there was a knock at the door of the jail. The jail, in those days was a wooden structure, later to be replaced by cells in the basement of the Courthouse. 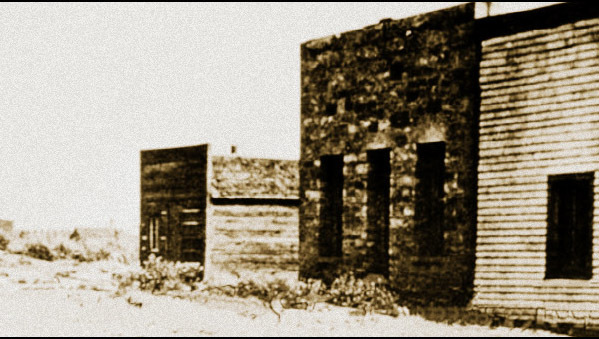 The old jail house, Rawlins, undated. Nevertheless, the citizenry of Rawlins left nothing to chance and promptly held a festivity for Big Nose at the corner of Front and Third Streets. The first effort using a Kerosine barrel was unsucessful. On the second attempt Big Nose was made to ascend a ladder leaning against a telegraph pole to which the rope was tied. When the ladder was pulled out from under him, Big Nose managed to get his hands free and cling to the pole where he begged for some one to take mercy and shoot him. No one did. Big Nose tired, let go and strangled to death. According to Hubert Howe Bancroft's 1890 History of Nevada, Colorado, and Wyoming, 1540-1888, two of Big Nose's compatriots, Jim Lacy and a gentleman named "Opium Bob" were also guests of honor at similar festivities. A third compatriot, "Tex" Carter allegedly was successful in escaping and later became a lawman in Nebraska. "A letter written from the east and addressed to this office asks if we can give any information as to the whereabouts of Big Nose George. We cannot give any definite information, but the last seen of him he was standing on a flour barrel near a telegraph pole, and a man with a stopwatch was standing near him and preparing to kick the flour barrel from under him. It is thought that the man with abnormal nasal protuberance has gone somewhere by telegraph. At an inquisition holden at Rawlins, in Carbon County on the 23rd day of March, A.D. 1881, before me. A.G. Edgerton, coroner for said county, upon the body of George Parrott, alias Big Nose George, lying dead, by the jurors whose names hereunto subscribed, the said jurors upon their oath to say that said Parrott, alias Big Nose George, was forcibly taken from the jail by a party of masked men to us unknown, taken to a telegraph pole and there hung by the neck with a rope until he was dead. Additionally, a death mask was made of Big Nose. I seemingly indicates that his ears were missing. It has been surmised that his ears were rubbed by contact with the rope during his death throes. he rest of Big Nose's remains were kept in a whiskey barrel which after several years was buried near Dr. Osborne's medical office in Rawlins. 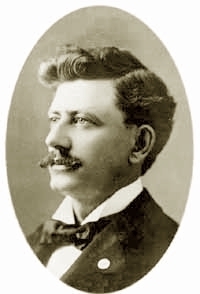 In 1892, Osborne was elected as Wyoming's first Democratic state governor. Allegedly, Gov. 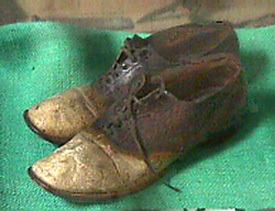 Osborne wore the shoes to the inaugural ceremony. In one sense, it may be said that Osborne sneaked into the Governor's Office when the Republicans were not looking. Returns from Converse and Fremont Counties were delayed and, thus, in a scene reminiscent of a recent election in another state, the State Cavassing Board was unable to certify the results. Taking matters into his own hands, Osborne on December 2, took the oath of office before a notary public and allegedly crawled along a ledge of the State House and crawled through a window into the Governor's Office and refused to leave, fearful that Acting Governor Barber would again take possession of the office. One source, indicates, however, that Osborne did not really sneak in; he hired a young boy to crawl along the ledge, climb through the window, and let him in. The scene culminated with a wrestling match between Acting Governor Barber's secretary, R. H. Repath, and Osborne for possession of the key to the office. On the left, the one story building is Dr. Osborne's medical office and drug store. Next to the Capitol, a gambling saloon, is the Bon Ton Saloon and to the right is a photography studio. The advantage of mule trains over ox drawn wagon trains was speed; that is while mule trains could not pull the loads of ox drawn trains they were much faster in speed. A mule train could overtake and pass ox trains. Osborne's election was probably more prompted by the panic of 1892 and public reaction to the Johnson County War, rather than to Osborne's actions with regard to Big Nose. In the panic of 1892 many mining interests went broke. In the 1950's a barrel was discovered in Rawlins containing human remains. A brief reunion of the skull cap with the remainder of the skull demonstrated that the remains were that of Big Nose. The skull cap was returned to the UP museum, the shoes are in the Carbon County Museum in Rawlins, and the medical bag has been lost. In addition to being governor, Dr. Osborne owned one of the first two automobiles in Rawlins and was also one of the largest sheepherders in the state. Osborne's term as governor was mainly noted for the dissension in the Legislature which was divided between three parties, 23 Republicans, 21 Democrats, and 5 Populists. United States senators were elected by state leglislatures and not by popular vote. Thirty ballots were had with no one receiving a majority. Accusations of bribery and poisoning were rife. Nat Baker was accused of taking a bribe. Leopold Kabis was accused of attempting to do in James Kime with a poisoned cocktail. After the Legislature adjourned, Osborne attempted to appoint A. C. Beckwith to the empty seat but the United States Senate failed to recognize the appointment. See Evanston. At first, Osborne planned on attending the ignauguration of fellow Democrat Grover Cleveland as President. Osborne, however, did not go. Had he attended, during his absense Osborne's old nemesis Secretary of State Amos W. Barber would have become acting governor and undoubedly would have filled all the vacancies, including the United States Senate seat, with Republicans. 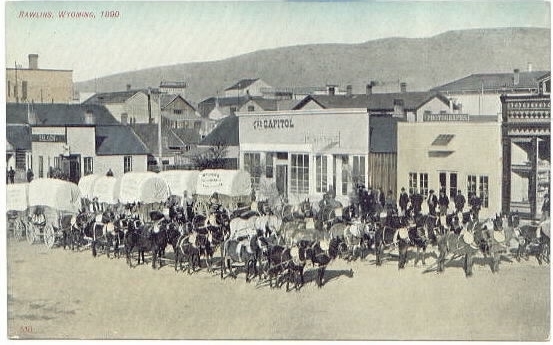 Wagons of the Wyoming Transportation Company, undated. 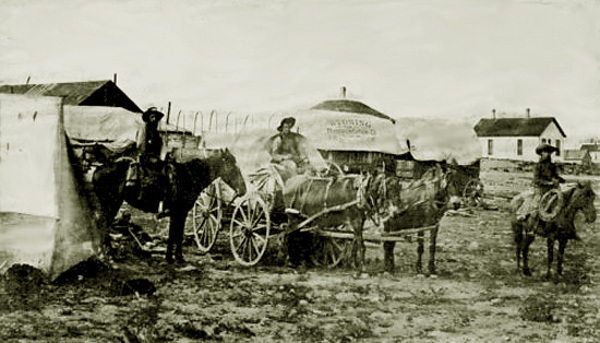 The Wyoming Transportation Company was owned by and provided the transportation services for J. W. Hugus and Co. For more discussion of J. W. Hugus, at the turn of the century one of the largest chain store operations in Wyoming and northern Colorado, see Saratoga. Rawlins photos continued on the next page.